This total does not include indirect employment - workers who are not directly employed in the coal industry, but whose jobs are supported by that industry. It is entirely possible that thousands - even tens of thousands - of workers are indirectly supported entirely by the coal industry. However, the National Coal Association's 1994 estimate that the coal industry directly and indirectly employs around 1.5 million people seems exaggerated. The level of indirect employment is in the low hundreds of thousands - not in the millions. A 2014 assessment of global jobs found coal provides about seven million worldwide, while renewables (excluding biomass) provide 5.4 million worldwide, despite having only a quarter of the energy share as coal. From these data, we can see the huge discrepancy in coal mine productivity between Western and Eastern mines. Montana (with 942 coal miners) produces more coal than Virginia (with 5,262 coal miners). Wyoming (with 5,837 coal miners) produces more coal than West Virginia, Kentucky, Pennsylvania, Virginia, Alabama, and Illinois combined (with a total of 58,995 coal miners). Due to this discrepancy, the coal mining industry has increasingly moved production to these Western states (especially to the Powder River Basin), and has dramatically cut its workforce in Appalachia. According to the U.S. Bureau of Labor Statistics, the average earnings of nonsupervisory coal workers in 2006 was $1,093 per week or $22.08 per hour. For private industry as a whole, average nonsupervisory worker earnings in 2006 were $568 per week or $16.76 per hour. In the coal, metal ore, and nonmetallic mineral mining industries, 19 percent of workers were union members in 2006, compared with 12 percent of workers throughout private industry. Wind industry jobs surpassed coal mining jobs in 2008, as wind employment increased by 70% from 50,000 in 2007 to 85,000 in 2008. According to Singh & Fehrs' 2001 analysis of Energy Information Administration data, the average coal-fired power plant - per megawatt of peak capacity - employs 0.18 people in operations & maintenance on a permanent basis. Thus, the average 300 MW coal-fired power plant would employ 54 people in operation & maintenance on an ongoing basis. This corresponds closely with the Energy Information Administration's assessment that, in 1997, the average 300 MW coal-fired power plant had 53 employees. This estimate of about 60,000 jobs in operations & maintenance in all U.S. coal-fired power plants seems reasonable, as 2006 U.S. Department of Labor data tells us that installation, maintenance, repair, and production occupations employed 160,980 people at all power plants in the U.S. in 2006. 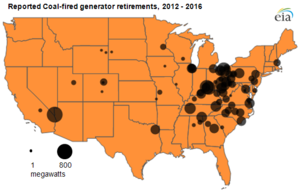 As coal power plants provided 31.2% of generating capacity and generated 49.0% of U.S. electricity in 2006, it seems reasonable that coal-fired power plants would employ 37.6% of power plant operations & maintenance workers in the U.S.
Average coal power plant employment has fallen dramatically over the past few decades - both due to technological developments and to rising labor costs. In 1985, according to the EIA, the average 300 MW coal-fired power plant had 78 employees; thus, employment per megawatt declined by 32% between 1985 and 1997. Again, according to their 2001 analysis of Energy Information Administration data, Singh & Fehrs - starting with the proportion of coal that is transported by various means (95.9% by rail, 3.8% by barge, and 0.4% by truck), then calculating the average jobs per unit cost for these shipping industries, then applying coal shipping costs to these calculations - estimate that coal transportation employed 30,757 workers in 1995. The average age of coal plant workers is 48 years. A study by Krishnan and Associates concluded that "a 2,000 MW coal-fired plant with about 200 to 250 employees will likely lose half its current plant staff in the next decade due to retirement, attrition and other similar issues." The average age of coal miners in West Virginia is 55. There are 54 coal mines in the U.S. that produced more than 4 million tons of coal in 2006; these 54 mines are located in 34 counties. The median 2005 poverty rate in these 34 counties was 15.5% - 17% higher than the U.S. average of 13.3%. The median 2000 per capita income in these 34 counties was $16,246 - 25% lower than the U.S. average of $21,587. Out of the 404 coal power plants in the U.S. with capacity over 100 MW, 80.4% are in counties that have a lower per capita income than the U.S. average. To a certain extent, there is an inverse relationship between poverty rates and income levels: the highest income levels tend to be in cities, where poverty rates are also high; lower income levels tend to be in rural areas, where poverty rates are also low. Thus, since most existing coal power plants are in rural areas, the poverty rates are roughly average for the U.S., even though per capita income in those areas is lower than average. However, out of the 404 U.S. coal plants with capacity over 100 MW, 82 - with a total capacity of 73,769 MW, or 22% of U.S. coal power capacity - are in counties that have poverty rates that are at least 25% higher than the U.S. average, as well as per capita income levels that are at least 20% lower than the U.S. average. These 82 plants are thus in some of the most economically devastated areas in the U.S.; 49 are in the South, 23 are in Appalachia, 32 are in counties that are either more than 25% black or more than 25% Latino, and 9 are in counties that are more than 20% Native American. A 2011 Ochs Center for Metropolitan Studies report, "A Fraction of the Jobs" found that power companies have overestimated the number of jobs created by new coal-fired power plants. The analysis looked at the six largest new coal-fired power plants to come online between 2005 and 2009, and combed through each project’s initial proposals and job projection data, including public statements, published documents and other material. They then compared that data to actual employment — before, during and after construction — in the areas where the projects were built, relying chiefly on the Bureau of Labor Statistics’ Quarterly Census of Employment and Wages. The decline of U.S. coal 2012-2016. In September 2011, the National Mining Association issued a press release stating that potentially 1.24 million jobs in 36 states had been destroyed by the Sierra Club’s “Beyond Coal” campaign aimed at stopping construction of new coal-based power plants. The number was based on NMA projections of jobs that would have been created had the plants come online. The Sierra Club stated that power companies routinely overstate the number of jobs that would be created by a new plant, and that the report did not take into account the jobs created in other energy sectors because the coal-fired power plants were not built. Some companies argue that coal regulations would affect jobs in the power industry and slow overall economic growth. A June 2011 study by the Economic Policy Institute (EPI), "A lifesaver, not a job killer: EPA's proposed "air toxics rule" is no threat to job growth" found that new regulations on mercury, arsenic and other toxic air pollution from power plants proposed by the Environmental Protection Agency (EPA) in March 2011 would actually have a slightly positive impact on job growth and economic health. The employment effect of the toxics rule on the utility industry itself could range from 17,000 jobs lost to 35,000 jobs gained. The toxics rule would create between 81,000 and 101,000 jobs in the pollution abatement and control industry (which includes suppliers such as steelmakers). Between 31,000 and 46,000 jobs would be lost due to higher energy prices leading to reductions in output. Assuming a re-spending multiplier of 0.5, and since the net impact of the above impacts is positive, another 9,000 to 53,000 jobs would be created through re-spending. According to MSHA data, the number of mining jobs in Appalachia has increased by 3.5 percent since the EPA began its enhanced review of mountaintop-removal permits in 2009, and 8.5 percent since the start of the 2008 recession. Grist argues that because underground mines employ more miners than mountaintop-removal mines for every ton of coal unearthed, stricter enforcement leads to an increase in mining jobs. An April 2011 study, “Mountaintop removal and Job Creation: Exploring the Relationship Using Spatial Regression” published in the peer-reviewed Annals of the Association of American Geographers (subscription req'd), looked at GIS data of West Virginia strip-mine permit boundaries and compared it to population and economic data to see if being located near a larger mining operation made a community more likely to have large numbers of residents employed by the coal industry. They found that, contrary to pro-MTR arguments, "there was no supporting evidence suggesting MTR contributed positively to nearby communities’ employment." The study said: "Our research question was straightforward: Is there a relationship between the size of MTR mining and employment, which justifies the ‘coal means jobs’ mantra? The results of the overall model suggested insufficient evidence to support a positive relationship between mine size (either MTR mining or underground mining) and percentage of the working population employed in coal mining. This finding casts doubt on the pervasive and dominant argument of MTR advocates." The study noted that it looked only at direct employment by the mining industry, and not other local occupations that service that industry. In October 2018, the administration of Pedro Sánchez struck a deal with unions for a €250 million investment program in mining regions over the next decade. More than 1,000 miners and subcontractors will lose their jobs when 10 mines close at the end of 2018. The miners were uneconomic but were kept open under a €2.1bn state aid plan. Under the jobs deal, 600 coal workers will benefit from social aid, while about 60% of the miners will be able to opt for early retirement. As recently as the 1960s, Spain had more than 100,000 coal miners. ↑ Labor Force Statistics from the Current Population Survey, Bureau of Labor Statistics website, U.S. Department of Labor, accessed July 2008. ↑ Coal Data: A Reference, Energy Information Administration, 1995. ↑ "Average Number of Employees by State and Mine Type, 2012 and 2013", Energy Information Administration, Annual Coal Report 2013. ↑ "Coal Data: A Reference", Energy Information Administration, 1995, pp. 65-68. ↑ "Coal Industry Annual 2000", Energy Information Administration, 2000, p. 64. ↑ "Annual Energy Review 2006", Energy Information Administration, 2006, p. 203. ↑ 12.0 12.1 Virinder Singh & Jeffrey Fehrs, The Work That Goes Into Renewable Energy, Renewable Energy Policy Project, 2001, p. 26. ↑ 14.0 14.1 14.2 Existing Electric Generating Units in the United States, 2005, Energy Information Administration, accessed April 2008. ↑ NAICS 221100 - Electric Power Generation, Transmission and Distribution, May 2007 National Industry-Specific Occupational Employment and Wage Estimates, Bureau of Labor Statistics, U.S. Department of Labor, 2007. ↑ Major U.S. Coal Mines, Energy Information Administration, accessed July 2008. ↑ 2005 County-Level Poverty Rates, Economic Research Service, U.S. Department of Agriculture, accessed July 2008. ↑ Per Capita Income in 1999, Census 2000 Summary File 3, U.S. Census Bureau American Fact Finder, accessed July 2008. ↑ 21.0 21.1 Tom Zeller, "Coal, Jobs and America’s Energy Future" NY Times, March 31, 2011. ↑ "Mining group study finds Sierra Club anti-coal campaign costs jobs" Platts, Sep. 7, 2011. ↑ Matt Wasson, "Kentucky coal companies remind us why we really, really need the EPA" Grist, June 29, 2011. ↑ James Bruggers, "Kentucky coal production, employment plummet: Dark days for coal," The Courier-Journal, April 4, 2013. "U.S. Coal Mine Employment by State, Region and Method of Mining - 2006," National Mining Association, December 2007. Aaron Lehmer, Renewable Energy Development Creates More Jobs than Fossil Fuels, Ella Baker Center for Human Rights. Roger Bezdek, Renewable Energy and Energy Efficiency: Economic Drivers for the 21st Century, American Solar Energy Society, 2007. Sarah White & Jason Walsh, Greener Pathways: Jobs and Workforce Development in the Clean Energy Economy, Center on Wisconsin Strategy, 2008. Joanna Lee et al, Green Cities, Green Jobs, Strategic Concepts in Organizing and Policy Education, 2007. "Appendix C: Wind Related Jobs and Economic Development,"
This page was last edited on 29 October 2018, at 19:08.